The 123rd Canton Fair was held ceremoniously in Guangzhou on April 25, 2018.The canton fair has been paid high attention all the time with great advantage of improving worldwide economic development. With global market becoming better and competitiveness of “Make in China “strengthen continuously, many enterprise from all over the world attend this Canton Fair.There are 60475 booth and more that 25000 domestic and foreign enterprises. As a famous motorcycle brand Haojin motorcycle not only has great creativity but also to be the high technology enterprise for expanding overseas market. 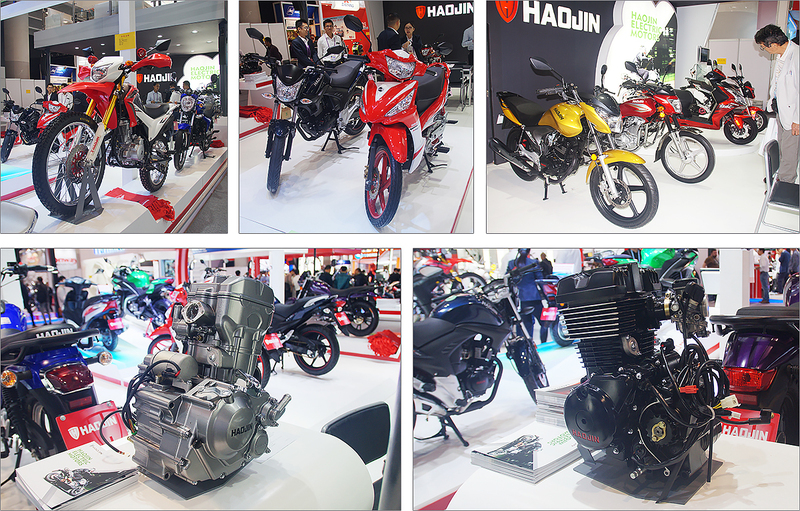 We Haojin motorcycle are confident for each Canton Fair.Haojin luxury lineup in Pazhou Exhibition led by the new model including off-road notorcycle HAWK,stree bike ARES,EVO,new GN model TAURUS,FABIO,new CGL RICO,Cub model LYRA , new E-bikes and so on.The fashionable design and advanced technology attract many customers for business discussion.Many customers speak highly of our CBR300 water-cool engine. It is our haojin with strong technology research and development and stable quality then we could stand forefront of motorcycle industry.Our products sells well in more than 50 countries area including Africa,South America,Middle-east,Southeast Asia,Euro etc and keep steady growth tendency. Our haojin booth has new design at this time which shows our good technology and as always great attitude.The new booth design looks like a great hawk spreads its wings which also make our haojin become the leading actor at the exhibition.At this time our haojin not only shows products but also shows our persure of good quality.Haojin motorcycle will spread our wings in 2018.